A unique Hallmark Keepsake Ornament – Reflects the charming styling of beloved master artist Mary Hamilton, whose endearing drawings have graced popular Hallmark greeting cards for more than 40 years. Keepsake Ornament studio artist Robert Chad sculpted this peaceful scene to add a bit of Keepsake magic to your holidays. 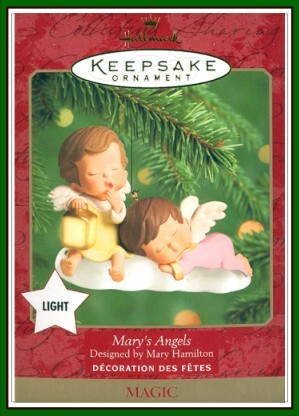 This lighted ornament, which glows softly in the clouds and lantern, also complements the Keepsake Ornament Collector’s Series of Mary’s Angels.